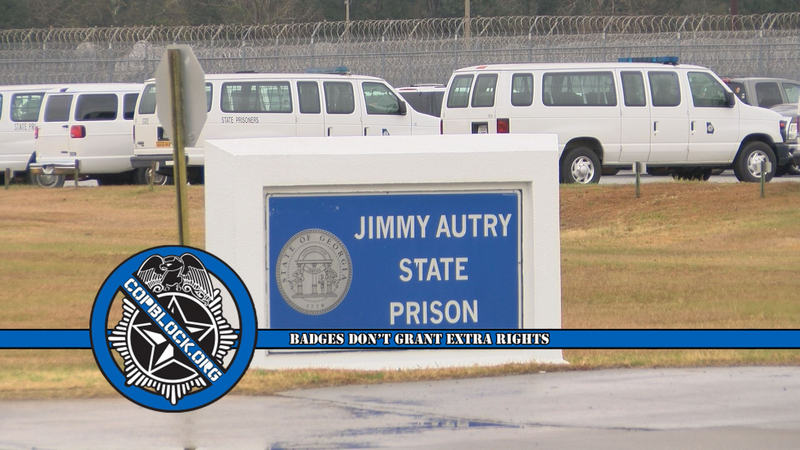 On Friday fifteen prison guards from the Autry State Prison in Mitchell County, GA were indicted by a federal grand jury for their part in a scam carried out by inmates within the prison. Including the guards and nineteen prisoners, more than 50 people in total were indicted for their involvement in the scheme to get people to send money to people they thought were police officers for fines they didn’t actually owe. Prosecutors say many of the officers helped prisoners get cell phones which they used to get on the internet and find potential scam victims. The prisoners, working with people on the outside, would call the victims posing as law enforcers and tell them they had to send money to avoid being arrested for missing jury duty. Shalonda Baker, 33, has been charged with conspiring to accept bribe payments to smuggle contraband into the prison. Leanna Bearden, 25, has been charged with conspiring to commit money laundering. Iesha Bell, 25, has been charged with conspiring to commit money laundering. Austin Bradley, 22, has been charged with conspiring to commit wire fraud and money laundering. Ashley Butler, 28, has been charged with conspiring to commit money laundering. Karhary Campbell, 37, has been charged with conspiring to commit wire fraud, to commit money laundering, and to bribe correctional officers to smuggle contraband into the prison. Toccara Cantrell, 30, has been charged with conspiring to commit money laundering. Cellie Clark, 35, has been charged with conspiring to commit money laundering, and money laundering. Jokelera Copeland, 28, a Correctional Officer at Autry State Prison, has been charged with conspiring to accept bribe payments to smuggle contraband into the prison. Jonathan Jamaal Daniels, 22, formerly a Correctional Officer at Autry State Prison, has been charged with accepting bribe payments to smuggle contraband into the prison. Willa Davis, 60, has been charged with conspiring to commit money laundering. Tyler Dickens, 22, formerly a Correctional Officer at Autry State Prison and formerly an Early County Sheriff’s Deputy, has been charged with conspiring to accept bribe payments to smuggle contraband into the prison. Renaldo Freeman, 30, a Correctional Officer at Autry State Prison, has been charged with conspiring to accept bribe payments to smuggle contraband into the prison. Caeser Futch, 36, has been charged with conspiring to commit money laundering. Dayia Gilbert, 23, formerly a Correctional Officer at Autry State Prison, has been charged with conspiring to accept bribe payments to smuggle contraband into the prison. Keri Hatcher, 29, has been charged with conspiring to commit money laundering. Chameta Isom, 32, a Correctional Officer at Autry State Prison, has been charged with conspiring to accept bribe payments to smuggle contraband into the prison. Bettie Jones, 53, has been charged with conspiring to bribe correctional officers at Autry State Prison to smuggle contraband into the prison. Brian Kennedy, 25, formerly a Correctional Officer at Autry State Prison, has been charged with accepting bribe payments to smuggle contraband into the prison. Laporshia Knight, 40, has been charged with conspiring to commit money laundering. Ricky Knight, 36, has been charged with conspiring to commit wire fraud, to commit money laundering, and to bribe correctional officers to smuggle contraband into the prison. Melissa Lloyd, 35, has been charged with conspiring to commit money laundering. Jessee Lopez, 37, has been charged with conspiring to commit wire fraud, to commit money laundering, and to bribe Correctional Officers to smuggle contraband into the prison. Calvin Martin, 21, formerly a Correctional Officer at Autry State Prison, has been charged with conspiring to accept bribe payments to smuggle contraband into the prison. Amber Mayes, 29, has been charged with conspiring to commit money laundering. Sharron McCoy, 26, has been charged with conspiring to commit wire fraud, to commit money laundering, and to bribe correctional officers to smuggle contraband into the prison. Cassaundra McGhee, 45, has been charged with conspiring to bribe correctional officers to smuggle contraband into the prison. Tadia Mercer, 41, formerly a Correctional Officer at Autry State Prison, has been charged with extortion under color of official right. Kiatya Milton, 42, formerly a Correctional Officer at Autry State Prison, has been charged with conspiring to commit wire fraud and money laundering. Tangela Parks, 33, has been charged with conspiring to commit money laundering. Steven Patterson, 29, has been charged with conspiring to commit wire fraud and money laundering. Reginald Perkins, 35, has been charged with conspiring to commit money laundering. David Pinder, 30, has been charged with conspiring to commit wire fraud and money laundering. Anthony Powell, 39, has been charged with wire fraud, conspiring to commit money laundering, and money laundering. Aida Rosa, 27, has been charged with conspiring to commit money laundering. Anthony Sanders, 25, has been charged with conspiring to commit wire fraud and money laundering. Terrance Shields, 41, has been charged with conspiring to commit wire fraud and money laundering. Clifford Smalls, 31, has been charged with wire fraud and money laundering. Shameik Spinks, 22, has been charged with conspiring to bribe correctional officers to smuggle contraband into the prison. Shebrikia Stewart, 28, formerly a Correctional Officer at Autry State Prison, has been charged with conspiring to accept bribe payments to smuggle contraband into the prison. Joseph Tate, Jr., 34, has been charged with conspiring commit wire fraud and money laundering. Edward Townsend, 40, has been charged with conspiring to commit money laundering. Derrick Watson, 36, has been charged with conspiring to smuggle contraband into the prison. Veronica Watters, 38, was charged with conspiring to have contraband smuggled into the prison. Douglas Welch, 34, has been charged with conspiring to commit money laundering and conspiring to bribe correctional officers to smuggle contraband into the prison. Benjamin Williams, 24, has been charged with conspiring to commit wire fraud and money laundering. Quintavious Williams, 20, has been charged with conspiring to bribe corrections officers to smuggle contraband into the prison. Shameka Williams, 31, a Correctional Officer at Autry State Prison, has been charged with accepting bribe payments in exchange for not reporting criminal acts of other Corrections Officers. Christina Wilson, 34, formerly a Correctional Officer at Autry State Prison, has been charged with conspiring to accept bribe payments to smuggle contraband into the prison. Ermesha Wingfield, 25, formerly a Correctional Officer at Autry State Prison, has been charged with conspiring to bribe Correctional Officers to smuggle contraband into the prison. Rokei Winston, 32, has been charged with conspiring to commit wire fraud and money laundering. To be somewhat fair though, the actual courts run this same scam on people that don’t show up when they have been ordered to attend jury duty. Although, it doesn’t say in the article whether the people being scammed actually had missed jury duty, that no doubt played some part in why this scheme was so “massive” and profitable enough to get over fifty people to jump on board.